Create "rich sounds with great density and character"
Turbulence is here to shake up your sounds. Promising to "bend and curl" your input signal in real time, Turbulence 2.0 is an updated "special distortion processor" from Sinevibes. 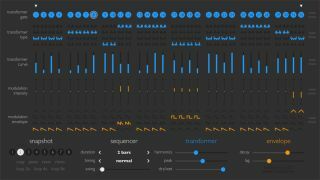 Available as a Mac Audio Units plugin, Turbulence comes billed as a "wave transformer", and is said to be capable of crafting new synthetic textures from even the most basic waveforms. Parameters can be 'animated' using the 32-step sequencer, with each of these steps having its own transformer model, curve and modulation envelope. You can find out more and download a demo of Turbulence 2.0 on the Sinevibes website. It costs $29.